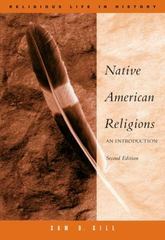 Native American Religions 2 Edition Revised for the first time in over twenty years, this brief introduction to the religions of Native Americans provides an overview of the latest research and thought in this area. In writing the book, Gill aims to introduce an academically and humanistically useful way of trying to appreciate and understand the complexity and diversity of Native American religions, as well as establish them as a significant field within religious studies. In addition, aspects of European-American history are examined in a search for sources of widespread misunderstandings about the character of Native American religions.